We all love Safari, mostly because it is perfectly optimized for iOS. However, this browser can lag and crash and that is really frustrating, mostly because iOS as an operating system is relatively stable. The reason for iPad Safari crash may be your cookies, logs, corrupted files or some other app that is interfering in its working. The good news is that this can be fixed and for that purpose we have this article that can be the perfect guide for your safari crashing on iPad problems. So let’s go. One of the main problems for frequent iPad Safari crashes is the cache, crash log or corrupted files. iPad itself can’t do much regarding these issues, that is why, the smartest thing to do is to use special software which aims to clean useless data on iPad. One of the best software for this problem is iMyFone Umate Pro or iMyFone Umate Pro for Mac. This space recovery and eraser software has help hundreds of thousands of iOS users with similar problems. 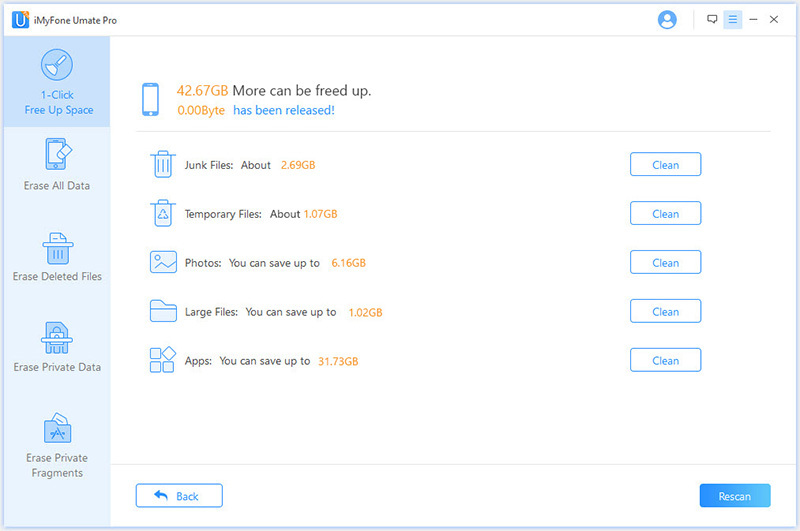 iMyfone Umate pro proved over the years that it is one of the best all in one software for data management of iPad and iPhone. It can do cache, system clean up of data and permanently delete of data. Its “Junk Files” function helps you to thoroughly remove app cache, crash logs, photos cache, iTunes cache, corrupted files, user storage files and more useless data from your iPad, which would help you to fix iPad Safari crash. No worries, it is totally free. So, how can we use it? Step 1: First you need to download iMyfone Umate Pro and install it on your computer and open it. Step 2: Then you need to connect it with your iPad and choose the option of “1-Click Free Up Space” from the left side of options. Hit “Quick Scan” button. Step 3: Tap “Clean” button beside “Junk Files” to start. Besides the junk files and cache, iPad Safari crash may be result of the old version of your operating system. Thus, one of the solution is to update the latest iOS version. Usually, the iPad will receive notifications when new version is available, accept it whenever you see it or go to Settings > General > Software Update. Additionally, you can stop Safari crashing on iPad by manually deleting your history and cookies within the software. Go to “Settings > Safari > Clear History and Website Data”. Safari stores data in order to keep running. This data may be a cause for the crashes if it is constantly piled up. To do this the steps are similar as the above mentioned. Go to “Settings > Safari > Advanced > Website Data > Remove All Website Data”. The Autofill can not only cause iPad Safari crashes, but it is also a cause for lags. So, the smartest thing to do is to clear and disable it. You can do this in “Settings > Safari > AutoFill”. You can turn Use Contact Info, Names and Passwords, and credit Cards on or off there. If you disable them, it will not automatically fill out web forms. Although you think the iCloud may do you good, it can cause crashes and lags. So, the smartest thing is to disable it too. Go to “Settings > iCloud” and turn off “Safari”. Choose “Delete from My iPhone” then. What iMyFone Umate Pro Can Do to Fix iPad Safari Crashes? Clean Safari Cache: The “Junk Files” can remove cache, corrupted files, crash logs and more in all your iPad apps and Safari cache is inclusive. Remove Safari Temp Files: When using apps, some invisible fragments will be produced. So does Safari. You can run “Temporary Files” on iMyFone to thoroughly clean those invisible fragments. It would also help to fix iPad Safari crashes. Permanently Delete Safari Cache, Cookies & History: You can run “Erase Private Data” to permanently remove Safari cache, cookies and history from your iPad, without any trace to be tracked or any invisible fragments. Completely Destroy Deleted Safari History: If you simply delete Safari history from your iPad, it would leave some trace in deep, which is also a cause of Safari crashing on iPad. Run “Erase Deleted Files” to find them out and completely destroy them. That’s what iMyFone Umate Pro can do to fix frequent iPad Safari crashes. However, it also have the features to manage your iPad space and private data. Running the “1-Click Free Up Space” will not only reclaim free space, but also optimize your iPad performance to boost it up. All iOS files are supported to be deleted or permanently deleted. No matter for the default iOS data, like messages, photos, call history, contacts, etc., or for third party app data, like WhatsApp, WeChat, SnapChat, Viber, etc., they all can be completely destroyed without zero chance of recovery. Why not download it and have a try?